thanks to alexwarrior1 for this youtube video! Post links to your video in the comment thread of this article and I'll embed them here on the front page! 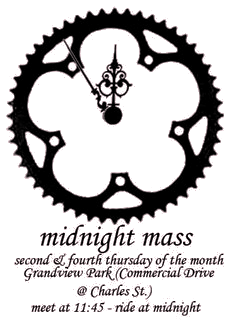 Friday is the Monthly Critical Mass Ride! All invited, ride a bike. The weather is getting better. Speak up about the election coming up! make way for the humans. Critical Mass is a fun invitation to car drivers to escape the trappings of car culture. Yes, there is a choice. It takes work but we can do it! Don't forget to tune into the Pedal Revolutionary Radio pre-CM broadcast on Coop Radio 102.7FM from 10:30AM-12noon on the day of CM. 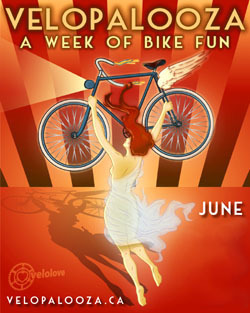 This month phone into the show 604-->684-8494 with a Bicycle Haiku and have it read on air! We're selling the Premier's house. Really. I'm not into mean spirited events targeting politicians as individuals rather than for their politics. This seems to be a fun spirited event and not meant to harass, but rather to make a very important point and to put something on the media radar that should be front page news: Even though all sides proport to support affordable housing there are very obvious bad decisions being made that the provincial government needs to be held accountable for. During the past year we have marched, leafleted, petitioned and rallied. Now it's time to turn up the heat. Before May 12th we need to hear explicit plans from both major parties about how they will put an end to the rampant housing crisis in B.C. One of the most blatant examples of government indifference to the housing issue is the plan to sell off Little Mountain Housing and other social housing sites to developers. Government has promised to put the proceeds of the sales into social housing sometime in the future, yet their only published plan is to build supportive housing for people with addictions and mental health problems. 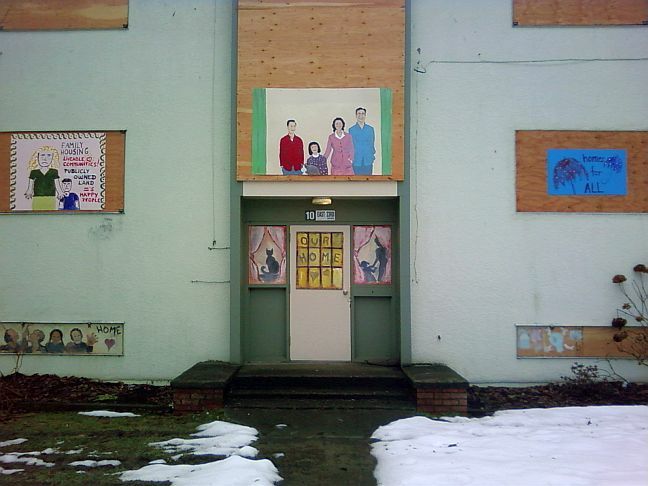 They have persistently ignored the urgent housing needs of low-income families. corporation. The government looked foolish and the sale was cancelled. Please join us for an hour on April 26 at 33rd and Quebec Street in Vancouver. An entertaining event with a very serious purpose. A crowd will make headlines. 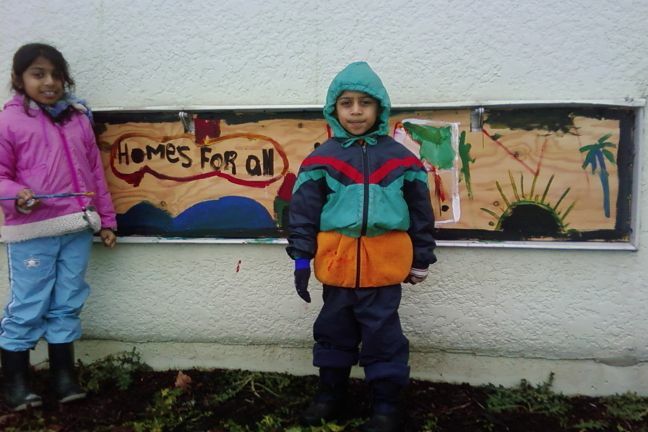 Because many low-income families cannot afford to live in B.C. If he can sell property that belongs to us, we figure we can sell property that belongs to him. Join us on April 26. Become a shareholder. You will receive an official, completely worthless certificate suitable for framing, entitling you to 1 share of the Premier's house. Have your photo taken with Mr. Con Dough. It's a freebie. April 26 Too hot to ski, too cold to camp. Just right for tossing politicians on the barbie. It will take you 45 minutes to participate and, if we get a big crowd and good news coverage, we just might influence government policy on affordable housing in this province. Come for the satire, stay for the garage sale. Yes, we're selling his garage too. Hi, Please pass this on to your cycling, walking and running friends who use the Bridge. Sorry to be sending yet another message on yet another delay of the decision on the trial. Again, I'm not sure of the reason for the delay, but at this point, I'm getting a bit concerned. The delay is a bit puzzling as both Mayor Roberson and Council Meggs have made public comments recently supporting the trial. It can be a brief message or your experiences and close calls on the bridge might help increase the sense of urgency. And invite your friends. Lets get over a 1000 members to show that there is a lot of support for the trial. You've probably heard the news on the corporate newswire that copying, (the primary technical function of the internet) is now supposed to be killed by this court in Europe. But I say no, we will actually win. The internet is about free sharing and open communication. Imagine the devastation to the economy if wikipedia was suddenly gone. How many times do you use it every week, every day? Free culture is invaluable. The site will live on! We are more determined than ever that what we do is right. Millions of users are a good proof of that. We have seen that some people that we dont know have started collecting donations for us, so we can pay those silly fines. We firmly ask you NOT to do this. Do not gather or send any money. We do not want them since we will not pay any fines! Seed those torrents a little bit more than you usually do! Buy a t-shirt and show the world where your sympathy is. If you live in Europe, vote in the election for the EU parliament in June. Continue to build the internets! Start more bittorrent sites, blog more, start your own lobby group, create, remix, mash up and continue to grow more heads on this amazing hydra that we know as the internets! Do not be afraid of using the network. Invite your friends to this and other file sharing systems. Calm people down if they're upset. We need to stay united. And say it loud say it proud! We are all The Pirate Bay! Personally I think Google and Facebook and those indespensible monopolies should all be nationalised. Except maybe not actually nationalised by any one country but instead an autonomous international federation giving public oversight but not big brotherish control... I haven't really been able to think of a realistic imaginary scenario for this kind of thing happening but the point is... we need to go in that direction. We can't expect these private companies beholden to the bottom line (short term thinking profit) to forever foot the bill for all this public common good forever just for the fame of it... We need to think about the future and how to make this public good publically owned (and cared for). 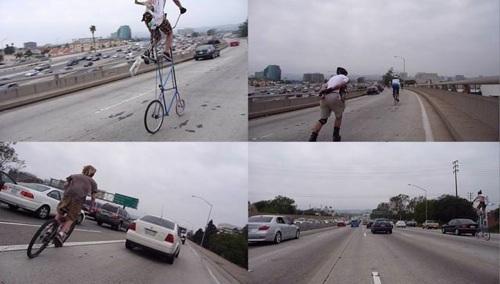 Let’s state the obvious: a street or a highway is completely useless if you don’t have wheels on which to ride over it. As an installation of public investment, a network of roads is only a half-done job. The point of all the shared public expense in this massive installation is to enable citizens and cargo to move around. Its construction has come at incalculable cost. Just consider the value of land alone that is taken up with streets. Add in the thousands of dollars for every stop sign, parking sign and safety sign, the hundreds of thousands of dollars for every set of traffic lights, the tens of millions for all the street lights and the hundred or so million for the water run-off system under the streets. Consider the annual costs of painting lines, rebuilding curbs, removing snow and street cleaning. Throw in the enormous costs of policing traffic, the court system, the price for a rapid response emergency crash system complete with fire trucks and ambulances no more than minutes away from anywhere, and add on the hospital costs of all those injured in the everyday operation of the road system. All of that, and still, the job is incomplete because the whole massive installation, surely amounting to billions for Vancouver alone, is utterly useless as it stands. One still needs to have some means of conveyance to give the whole enormously expensive system any value at all. It is the running of buses through the road system that completes the picture, that finally finishes the job and gives the public any value out of the whole works. As a proportion of the total that’s been invested already and the ongoing maintenance and service costs, adding buses amounts to probably less than 1% more when everything from fire trucks to hospitals to police and snow removal are considered. Without buses, it’s as though someone built 99 feet of a 100 foot bridge and can’t find the will to build that final foot that finally makes the whole bridge worthwhile. A network of bus routes and a sufficient number of buses running through it is not an add-on that can be considered or rejected, it is the sine qua non that delivers to the investors—the public—the value promised in all the funds collected from them over the decades. A public road system without a public means to put it to use is like a fine expensive bicycle without any wheels. Nice so far, but useless. Of course, a lot of people have cars, and so the road system is rendered useful to them. The final 1% of the job that makes all the difference between an expensive public system useful to the public that built it and a completely useless waste of billions is to be supplied by private individual investors. It’s the equivalent of building at great public expense a massive health care system and then restricting access exclusively to those able to pay an expensive private access fee. But because the buses were the final part of the whole public road installation and because we’ve gone on so long thinking of buses as an add-on to an otherwise complete job, nobody anymore thinks of buses as essential to the concept of the public transportation system. 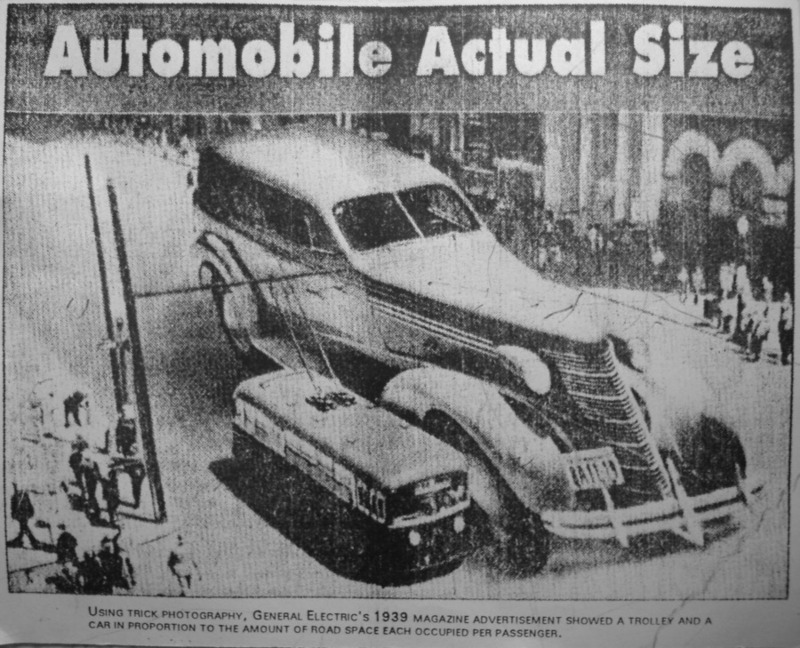 One need only recall that the road system was installed first and then everybody had to buy private cars to use it, to appreciate the enormity of the betrayal. It wasn’t as though everyone already had a car and demanded the construction of roads to use them on. It is in this context through which reports of Translink’s funding shortfalls should be viewed. Translink is the public agency responsible for the roads and the provision of buses to be used upon them. Once the roads were built, the provision of an appropriate level of bus service has perennially been a bone of contention. The final 1% of the total cost of a public transportation investment—that mere 1%—has been the downfall of the whole idea. Now there are proposals to reduce bus service, cancel routes, shorten the service day and massively increase fares, all because the bus provision part of the system is said to lose money. Never mind that the street light part of the system “loses” a lot more money, as does the street sign part, the land-owning part, the water run-off part, the ambulance part, the hospital part, the snow removal part and so on. Why is there no talk of removing traffic lights if money is tight? These do nothing but lose money also. The roads themselves should just as whimsically be considered for ripping up, the land beneath them sold, so much do roads do nothing but lose money. But only the bus portion of the system is scrutinized for its costs, and is expected to generate revenue to cover those costs. Drivers of cars are outraged they will be asked to pay tolls to cross the newly reconstructed Port Mann Bridge—cost: $3 billion—even though bus riders have been paying far more in tolls to use the public roads everyday since forever. We’re promised by the provincial government that bus service across the new Port Mann Bridge could someday in the future be added, as though the bridge will have delivered its public value in total even without the provision of a bus service across it. Even if a resident of Langley got the global climate message and wanted to make an effort to change and stop using a carbon-burning car, the lack of the final part of the system—wheels with which to roll over the terrifically expensive road system between Vancouver and Langley—they could not do so. The bus part was left off the agenda in the end, like a roof being left off a palace, rendering it useless. It is in this view absurd that the public must now agitate for buses to make the whole road system they already built finally of value to them. It is a moral outrage that what buses exist require an exorbitant toll for every use of them. It is unethical in the extreme for bureaucrats and political leaders alike to portray the bus service as an extra add-on to a road system, subjected to its own separate accounting, when no other part of the system is so separately scrutinized. And it is reprehensible for any public official to dare suggest any measure that reduces already deplorable bus service with the environmental cost of the private car alternative so severe, so obvious and so broadly understood. Everyone should be able to ride without a toll over the entire regional road network since we already all paid for it. It’s a nasty trick to deliver 99% of the deal and withhold for ransom the important final 1% of the hardware. Imagine being sold a car and then finding out the wheels are extra. That’s the insult the public has been slapped with for decades. Only in defeat and exasperation, not to mention at great additional personal expense, have those with the means given up and bought a car. No public official should escape profound shame for suggesting tolls for buses are fair, let alone that they should be raised, and for suggesting yet more public investment in infrastructure like roads and bridges without considering their primary purpose of delivering the wheels with which to make them of any value to the public. Every time you want to travel the roads and there is no bus for you, you are profoundly betrayed, and every time you are made to pay to board the bus is the ransom of a hostage captured and roasted alive by their very own government. 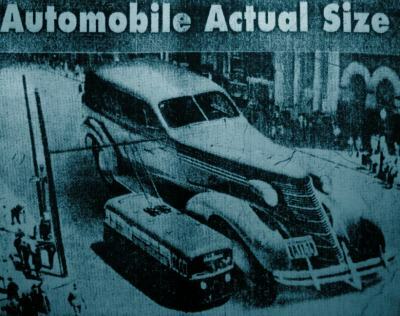 Buses are the road system; it is the cars that are the extra add-on. PLEASE POST AND FORWARD FAR AND WIDE! HELP MAKE HISTORY: HOIST YOUR BANNER HIGH on Highway 1 overpasses from Eagleridge Bluffs to Chilliwack! SATURDAY APRIL 11, FROM 11am to 1pm, take a stand for green ways, not freeways with concerned residents across the region. FOR THE SAME COST as the Port Mann mega-project we can build a light rail metropolis- creating jobs, reducing traffic and air pollution. Don't let Gordon Campbell pave over our communities and farmland! ADOPT A HIGHWAY 1 OVERPASS near you or join with others to adopt one. SIGN UP your friends and family, your organization and business! Don't have a banner? We've got one for you! Banner-making parties in progress. CONTACT US at info@gatewaytowhat.org to find out more.